Cape Town is the second-most populous city in South Africa, and the largest in land area, forming part of the City of Cape Town metropolitan municipality. It is the provincial capital and primate city of the Western Cape, as well as the legislative capital of South Africa, where the National Parliament and many government offices are situated. Cape Town is famous for its harbour as well as its natural setting in the Cape floral kingdom, including such well-known landmarks as Table Mountain and Cape Point. Cape Town is Africa's most popular destination for tourism. Located on the shore of Table Bay, Cape Town was originally developed by the Dutch East India Company as a victualling (supply) station for Dutch ships sailing to Eastern Africa, India, and the Far East. Jan van Riebeeck's arrival on 6 April 1652 established the first permanent European settlement in South Africa. Cape Town quickly outgrew its original purpose as the first European outpost at the Castle of Good Hope, becoming the economic and cultural hub of the Cape Colony. 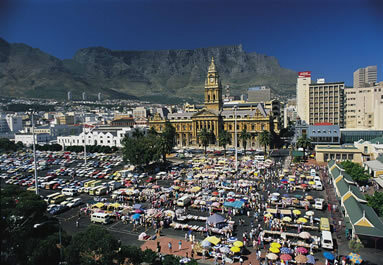 Until the Witwatersrand Gold Rush and the development of Johannesburg, Cape Town was the largest city in South Africa. It is one of the most multicultural cities in the world, reflecting its role as a major destination for immigrants and expatriates to South Africa. As of 2007 the city had an estimated population of 3.5 million. Cape Town's land area of 2,455 square kilometres (948 sq mi) is larger than other South African cities, resulting in a comparatively lower population density of 1,425 inhabitants per square kilometre (3,690 /sq mi). Traces of the tools of early stone age hunter-gatherers found in the area of modern day Cape Town indicate that this area was inhabited by prehistoric people as much as 600 000 years ago. Most well known of these prehistoric hunter-gatherer is probably the the San (Bushmen) which relied almost solely on what the seashore had to offer for their food. About 2000 years ago the San was displaced by the Khoikhoi from the north, bringing with them their herds of cattle and sheep. By the time the first Europeans settled into the Table Bay area the Khoikhoi was the dominant tribe in the area. The first European settlement in the Cape Town area was in the form of a supply station established in1652 by the Dutch East India Company at the newly christened Cape of Good Hope. This supply station quickly evolved into a colonial settlement. With the growth of the settlement the Khoi-San was driven away and slaves had to be imported from Madagascar, India, Ceylon, Malaya, and Indonesia to help build the colonial settlement. By the early 18th century the Western Cape Khoikhoi population had completely disintegrated and the influx of German and French religious refugees swelled the European population. At that time slavery had become the economic backbone of the colony. By 1750 Cape Town had become a town with over 1000 buildings and 2500 inhabitants. In order to secure this strategic sea route to the east, Britain quickly grabbed Cape Town in 1795. This was not welcomed by the Calvinist Dutch Burghers but for the substantial Muslim Slave population this was good news as the British soon ordered the abolition of slavery. The British also allowed freedom of religion resulting in the first Mosque built in Dorp Street in the Bo-Kaap. By the 19th century Cape Town had a Seaport of major significance and department stores, banks and insurance company buildings became evident everywhere. Victoria road was built from City to Sea Point and a Suburban railway line to Wynberg laid. As slavery was abolished convict labor had to be imported from the colonial frontier in the Eastern Cape to build the city. Cape Town became the legislative capital of the union in1910. By 1945 the increasing industrialization had attracted an influx of black workers which were housed in the locations of Guguletu and Nyanga. Three years later the National Party came to power and they introduced a policy that favored coloureds over blacks for employment. The Langa township of Cape Town became a stronghold of the Pan Africanist Congress (PAC) . On April8,1960 the PAC organized a peaceful anti-pass demonstration in Cape Town. The police opposed the demonstration killing three demonstrators and wounding many. As a result of this incident the government declared a state of emergency and consequently anti-apartheid groups such as the PAC & ANC was banned. In 1966 the government introduced the group areas act. As a result of this act coloured communities were removed from district six to the desolate Cape Flats. Here gangsterism took root which is still prelevant today in the Cape Flats. Cape Town is not only the most popular international tourist destination in South Africa, but also one of Africa's most popular international tourist destinations. This is due to its good climate, natural setting, and well-developed infrastructure. The city has several well-known natural features that attract tourists, most notably Table Mountain, which forms a large part of the Table Mountain National Park and is the back end of the City Bowl. Reaching the top of the mountain can be achieved either by hiking up, or by taking the Table Mountain Cableway. Cape Point is recognised as the dramatic headland at the end of the Cape Peninsula. Many tourists also drive along Chapman's Peak Drive, a narrow road that links Noordhoek with Hout Bay, for the views of the Atlantic Ocean and nearby mountains. It is possible to either drive or hike up Signal Hill for closer views of the City Bowl and Table Mountain.